You can look at some corporate ecards and know instantly what they represent, while others are of a more symbolic nature. These ecards entitled Dreaming Ideas fall into the latter category but once you look at it, it becomes very clear. The blue sky, pictured here on a summers day, is a symbol of a clear head and clear thinking with only a few light fluffy summer clouds that will briefly cloud your judgement before moving on. 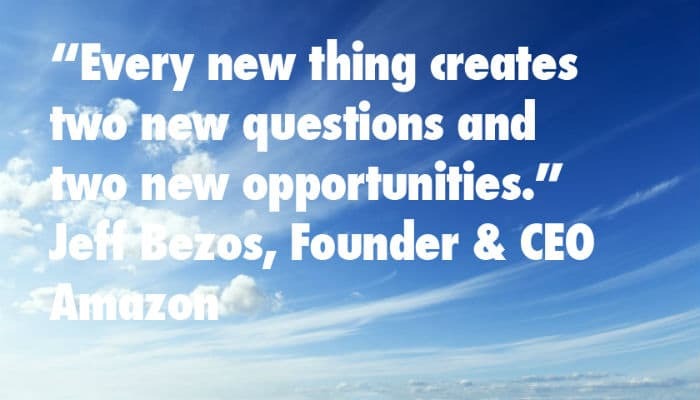 Jeff Bezos is the founder, and CEO, of Amazon and he has provided the quote on this card; “Every new thing creates two new question and two new opportunities”. To be able to turn those questions into opportunities you need a clear mind, or blue sky thinking. These are perfect ecards to send to a business associate who may be struggling with a decision regarding their career and spends more time frowning that smiling. This is the sign of somebody who is not thinking clearly and by sending them this card you may just see the clouds in their mind clearing. The fact that ecards are permanent and won't be torn or thrown in the trash like a cardboard card means that they can keep checking back and looking at it every time they feel those clouds coming over again...... Did you know that we actually specialise in Christmas ecards for business? So if your company is looking for some extra corporate professional ecards then give us a try.